Rattlesnake! Here is Arizona – we have over 13 identified species of rattlesnakes. Not good. However, here at Halstead – also in Arizona – we have over 40 different varieties of Snake Chains. That’s Real Good! A Snake Chain is made up of round, wavy, smooth metal plates– that are joined together to form a flexible chain. Somewhat like a smooth snakeskin. 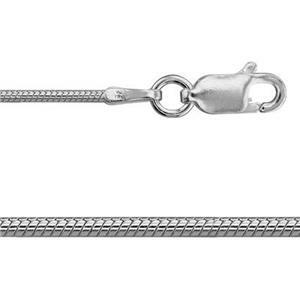 Here’s one that you can actually pick up and handle – our 2SN124 – Bright, Sterling Silver 24-inch finished Snake Chain with a Lobster Claw on its tail! (No rattles here!) And if that isn’t striking enough for you – add one of our Sterling Silver Charms.